See that title? I originally typed “10 Best Birds of 2018.” Which, I think, says something about birding–no matter how great a year you’ve had, you’re always looking ahead to the next great birding experience. 2017 was a great year filled with once-in-a-lifetime trips and it was a struggle to narrow this list down. I don’t have many trips planned for 2018– only three and one is for family and one is a weekend trip and none are outside the United States–but a Best Birds list is 40% the bird and 60% the experience, so I’m sure 2018 will be just as wonderful (avian speaking). 1. Lucy’s Warbler, Virginia, January. Nothing like beginning the year at a landfill! I already had my drive down to Florida planned, and it just took a few tweaks to change my route from straight I95 to a detour through the DelMarVa Peninsula. Ned Brinkley had found a Lucy’s Warbler in the Cheriton Landfill, at the Virginia end of the peninsula, on December 31st as part of the area’s Christmas Bird Count (what would we do without CBC’s?). A first record for the state, a second record for eastern North America, and a Life Bird for me. I saw the tiny gray warbler on January 6th, the last day it was documented. It was very active, moving along the vegetation by the water quickly, hopefully eating enough to continue on its journey. As birders arrived in ones and twos, those of us who had already seen the warbler helped get them on the bird, which excelled at moving out of sight as soon as it was spotted (my excuse for no photo). 2. Ross’s Gull, NYS, January. 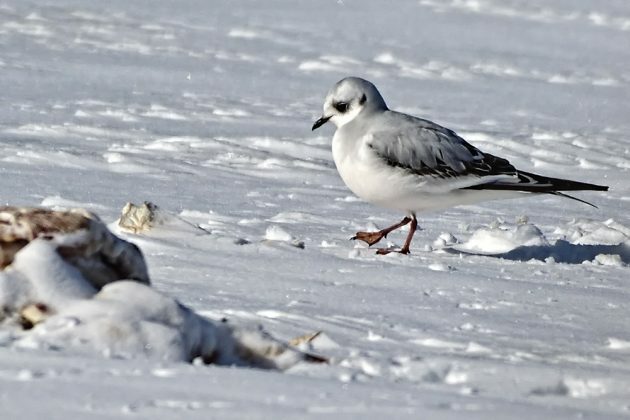 I got word of the appearance of a first year Ross’s Gull at Tupper Lake, New York on January 26th as I was driving through Georgia on my way back from my Floridian sojourn. Now, two things: (1) Ross’s Gull is as close as I’ve ever gotten to a nemesis bird, and though I only chased it one time, to an obscure village in snowy, stormy Canada, that chase was so traumatic (I ended up in the E.R. with a damaged eye–don’t ask), the gull’s image has taunted me with its beauty and remoteness. (2) I was about to stop for a visit with a friend who lives in a birding paradise island outside of Savannah and who, though a birder, is not a chaser, and who I did not think would look kindly on me blowing off the visit to twitch a gull. Birds or people, people or birds, the eternal question. To make a long story short, I visited with my friend, drove home, slept, got up early and drove upstate and saw my most wanted bird. It was a lovely, graceful dove-like gull, surprisingly the only bird on Tupper Lake except for a couple of Bald Eagles (stay away from The Gull!) and a Common Raven. Now that I have broken through on my Nemesis Bird, my next goal is to see more Ross’s Gulls, hopefully adults with that legendary pinkish glow. Runner-up in the gull category has to be the very cooperative Black-headed Gull that remained at Camman’s Pond, Long Island, into the early weeks of January. 3. Great Gray Owl, NYS, March. Winter 2017 is the year downstate New York birders will remember as the year they learned how to drive upstate. 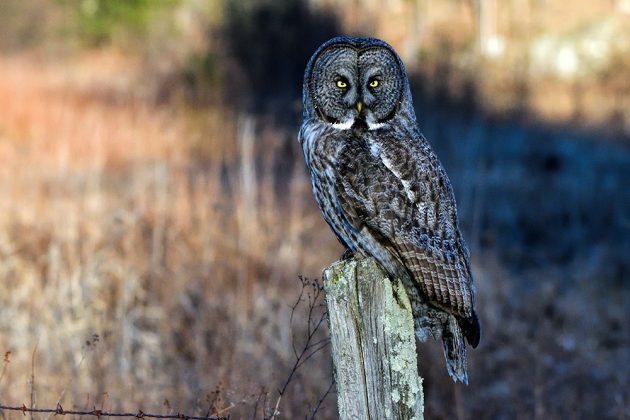 First there was the Ross’s Gull, then the Great Gray Owls in Robert Moses State Park (the one near the NYS/Canada border, not the park in Long Island), and then, just when you think the greatness is over, birders were alerted to a Great Gray Owl in Keene (N.Y., not New Hampshire), a town in the Adirondacks. My friend Ian and I drove up; we’d already seen the far-upstate Great Grays, but who could resist? At five hours, it seemed like a comparatively short drive. Initially the bird stayed at a photographically challenged distance, along the woods bordering its usual field. Ian and I went for a yummy lunch, and on returning, stood with a group of birders and locals watching the Great Gray Owl fly across the field, alight on a far post, fly to the top of a conifer, fly to the opposite end of the field, and then–it flew and landed on a post little more than five feet from our group. In silence, we photographed and observed and worshipped the stately, wondrous creature. It seemed like forever, but it was really 3 minutes. And, then it flew off and our hearts started beating again. 4. Blue-headed Quail-Dove, Cuba, March. The Blue-headed Quail-Dove was one of four Quail-Dove species I saw in Cuba, three of them Life Birds (Blue-headed, Gray-fronted, Ruddy), one (Key West) a welcome year bird. All the Quail-Doves are striking birds, with the endemic Blue-headed topping the list. This is also an endangered species, though you wouldn’t know it by the ease with which my group viewed them at Refugio de Fauna Bermeja (checking the trip report, however, I see that we only saw four!). 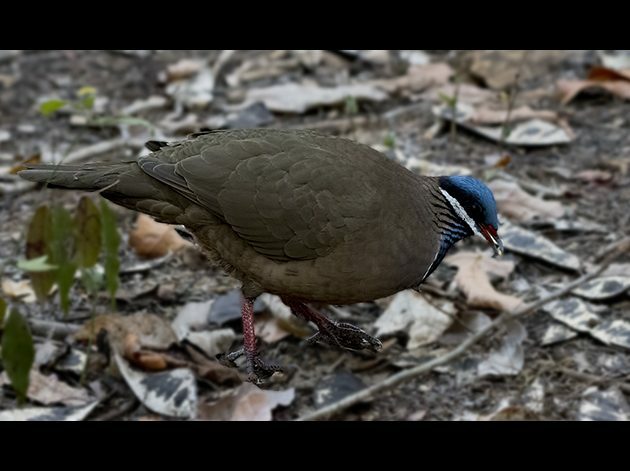 Blue- headed and Gray-fronted Quail-Doves (also endemic) eagerly walked in to feed on seed provided by the refuge caretakers. We observed them, along with numerous Zenaida Doves, from a blind; the birds never stopped moving, never stopped eating, and I never stopped trying to get a decent photo. Narrowing down my favorite birds from this trip was very tough; the Quail-Dove was pretty much tied with the totally adorable Cuban Tody and only won out because I did not include it in my Cuba post (a reminder that I have more to write about my trip to Cuba). 5. Zapata Wren, Cuba, March. 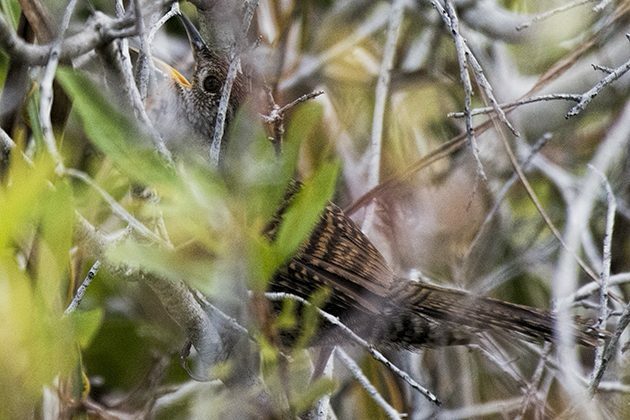 I wrote about my experience finding and attempting to photograph the endemic Zapata Wren in my post on Cuba, but I didn’t write about the endangered status of the wren. The degradation of the Zapata Swamp due to wetland drainage, agricultural expansion, and possible predation by introduced mongooses and rats* has resulted in a continuing decline of a species that was once common. On the positive side, a 1992 survey “suggests that this species might be more common than previously feared.”* Areas of the Zapata Swamp are protected; let’s hope that its popularity as a birding site will encourage Cuban authorities to enforce these protections and take other conservation measures that will protect the Zapata Wren, Zapata Sparrow, and the legendary Zapata Rail. Don’t you love it when you target a bird, research and strategize on how to find it, and everything works out? 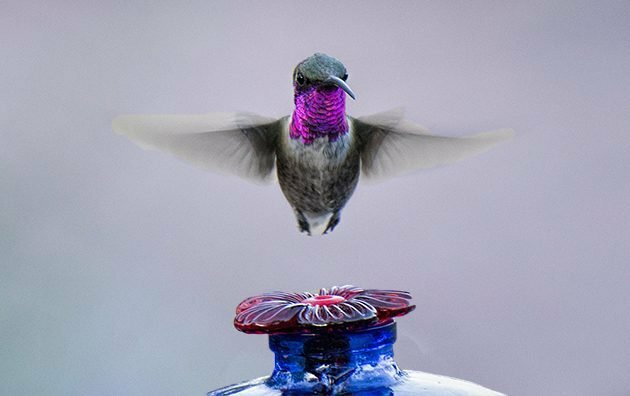 Lucifer Hummingbird was a major target for my summer Arizona birding trip and my preparation paid off with a visit to Ash Canyon Bed & Breakfast and its owner, Mary Jo, in the Huachuca Mountains, as described in my Arizona post. I observed at least seven Lucifer Hummers on my trip–at Mary Jo’s on two separate visits (one on my own, one with my New Jersey Audubon group) and in Portal at a private residence, courtesy of my hosts Lori and Mark who know everybody in Portal. An unexpected, joyous wealth of tiny, purple-throated bundles of energy. 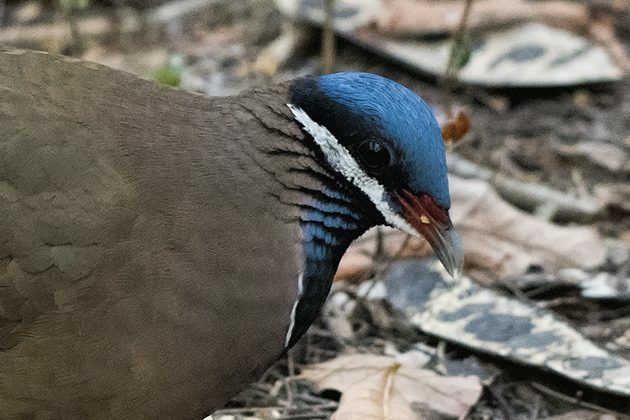 Like Harlequin Ducks and Atlantic Puffins, male Montezuma Quail have been gifted with a face so beautifully and definitively patterned one has trouble believing it is real. Their bodies, comprised of intricate patternings that change from wavy lines on the back to white spots on gray on the sides to a deep chestnut brown on the chest leading down to black, are also pretty impressive. 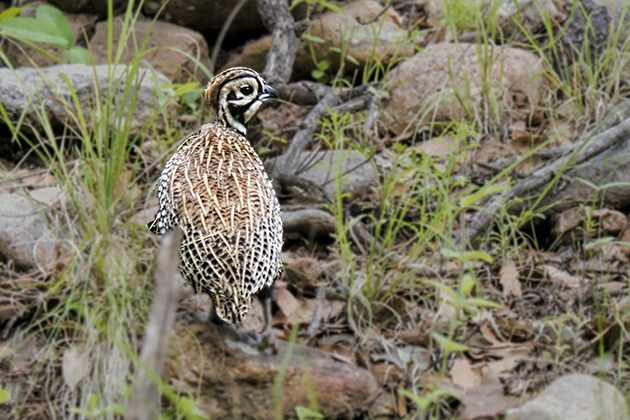 I ran into Montezuma Quail two times on my Arizona trip–once hiking down Ramsey Canyon, where a couple ran away as soon as I touched my camera, and here, in South Fork, Portal. Lori, Mark and I had just finished an unsuccessful quest for Elegant Trogon (well, Mark saw a Trogon, Lori and I were doing the bathroom thing), gotten in the SUV to head back to their house (or, as I call it, the Enchanted Bird Haven of Portal), when I saw several creatures crossing the road ahead of us. “Stop!” Lori yelled to Mark. And he did and we clicked. A much wished-for species on my bucket photo list (and I hope to return soon for an even better one plus the Trogon!). A big bird deserves a big picture. 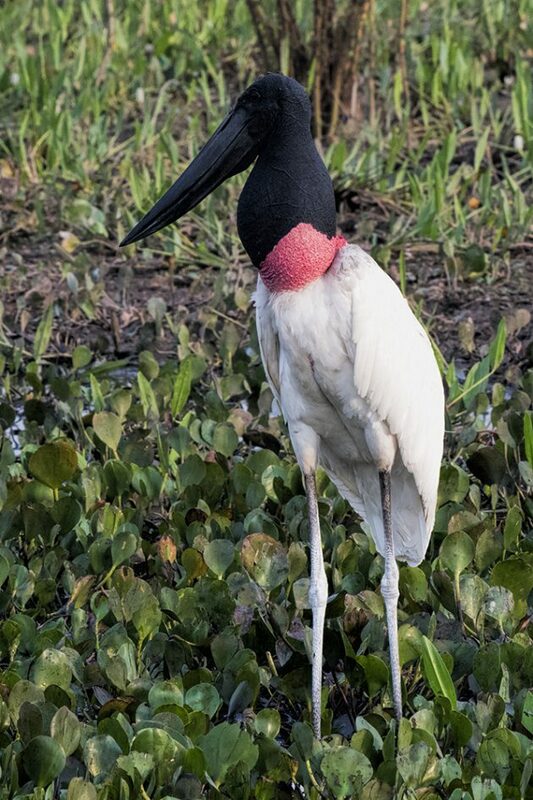 It took a while before I saw my first Jabiru on my excellent trip to Brazil, and Carlos Sanchez, our excellent leader (and 10,000 Birds contributor) must have gotten tired of reassuring me. But once we entered the Pantanal, we saw oh so many–in the fields, in the water, in nests on the tops of large, sturdy trees–and I was very happy. The impressive size of the Jabiru really does not communicate how amusing the bird can be, rolling its neck or drinking and squirting water right in your face (and we will be showing Ian’s video of that great moment at our Queens County Bird Club presentation in February, if you’re around). There are many runner-ups in the best bird, Brazil sub-category, including Sunbittern, Gray-cowled Wood-rail, Zigzag Heron, Bare-eyed Antbird, Snow-capped Manakin, Hyacinth Macaw, Yellow-billed Cardinal, and….oh, let’s just leave it at that and get thee to Brazil. 9. Chaco Eagle, Brazil, September. 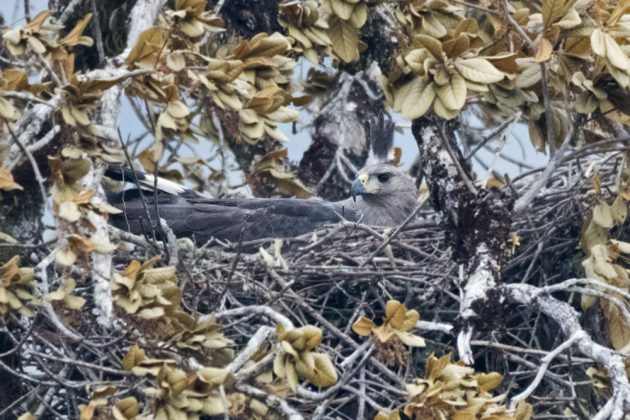 Also known as the Solitary Crowned Eagle, my small Brazil group was fortunate to see this mama on her massive nest in the Cerrado area, northeast of Cuiaba. The eagle, one of the largest in the Americas and part of a small, fragmented population, was found by Giuliano Bernardon, brother of our Birding Pantanal guide Bianca, and we were guided to it by the owner of our lodge, Pousada do Parque. Actually, we were guided up a mountain that enabled us to be on the same level as the Chaco Eagle and her nest, within and across a landscape of ash and embers. The area had been burning as recently as the day before. It was an unexpected adventure, the excitement tinged by concern for the future of the eagle and her eggs. 10. Corn Crake, NYS, November. 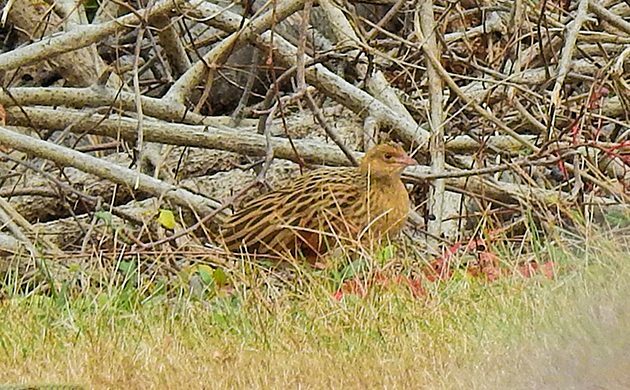 Last, but absolutely not least, is the Corn Crake that was found by Ken Feustel November 7th on Ocean Parkway, a road which traverses a major barrier island off of Long Island. The Corn Crake delighted birders for two days before its life was cut short, probably by a car in the early morning, dark hours. This appears to be the fate of the few Corn Crakes that have appeared along the eastern shores of North America–death by car or cat. I prefer to focus on the delightful experience of twitching the crake–picking up my friend Richard, the hope that the bird will Be There as we negotiated bridges and traffic, the joy of being put on the crake immediately by friends, and the happiness of sharing the bird with other friends as they arrived, everyone very excited, very well-behaved. I am told that I will probably never have as good a look at a Corn Crake again in my lifetime. I only hope that the species continues its upturn in population in its native lands. * Ferminia cerverai (Zapata Wren), The IUCN Red List of Threatened Species, 2017, http://dx.doi.org/10.2305/IUCN.UK.2017-1.RLTS.T22711392A111065824.en. Pretty nice set of birds! Looking forward to hearing about your sightings in 2018. My top ten which I will be publishing in the next couple of days has a three-bird overlap with yours! And two of them are the same individual! Corey–Ha! It was that kind of a Gray Crakey Jabijabiru year! And, Pat, I am always envious and delighted by your sightings in Bird Paradise CR. That quail dove is INNNNcredible! Happy New Year, Donna.